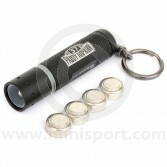 As part of our extensive Mini Accessories & Merchandise collections, we stock a complete range of LED Lenser Torches - a practical accessory for all keen motorists. LED Lenser is the leading manufacturer of flashlights, headlamps and accessories and their line of automotive flashlights have gained popularity with mechanics and drivers alike. We stock LED Lenser torches in 16 Lumens, 25 Lumens, 60 Lumens, 105 Lumen and 200 Lumen specifications with larger head sizes for an increased lighting range. We are also stockists of the LED Lenser Black Head Torch in 60 and 80 Lumens.